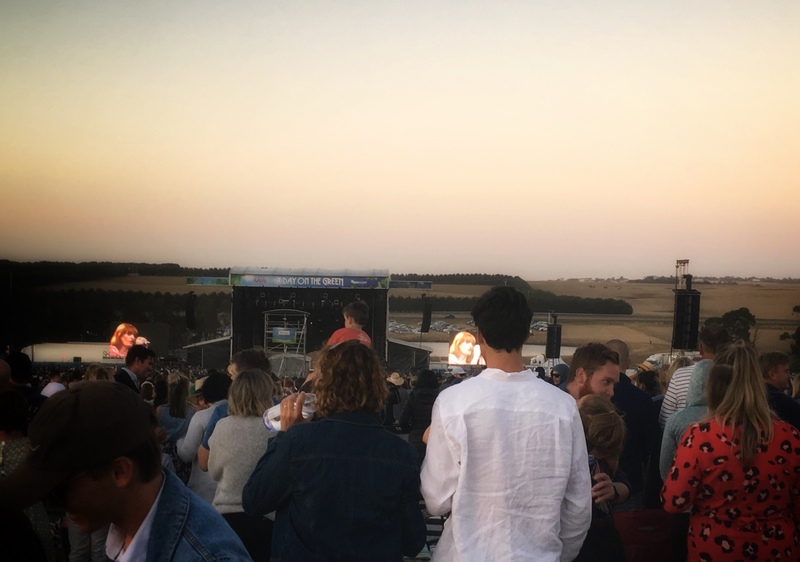 Dusk’s multicoloured cloak enrobes the hills outside Geelong, softening the dry brown grass hills into something beautiful, a burgeoning moon rising of over the hill. This is when Florence and the Machine take the stage. A wild will-o-the wisp trips across the stage, a heart and head of burning, fierce joy. Her gossamer wings and tail spinning and swirling across the stage in frenetic exultation. She entreats us to dance and to love one another in the practiced cadence of a spoken word poet, something childlike in her voice. Ensnaring us in gothic magic, the age-old trappings of song. The supplicant crowd moves, undulating, swaying, hands clasped and smiling, unrestrained in formless dance. A girl draped over her mother’s hip, bedecked in a flower crown, smiles beatifically at the crowd. Another rides high on her father’s shoulders, silhouetted against the bright stage lights. Babies tucked beneath arms, wrapped in blankets in their carriers, their mothers swaying as the babes slumber on. As the last notes fade, last sunlight sunk beneath the weight of evening sky, we the crowd file out under soft fairy lights and the stars, carrying away picnic rugs and baskets, throats husky and hearts buoyant from those free moments in the half-dark where we could just embrace the unrestrained joy of being.